On Tuesday 17th July we attended the opening of the newly redeveloped Newton Park. The park originally flooded after heavy rainfall, causing damage to residential properties around and downstream of the park. Severe river water pollution also caused the park to suffer, meaning flooding brought further health issues to residents and negatively impacted local ecology. Metis prepared the Outline Business Case that was successful in allocation of approximately £300k of capital funding by the Environment Agency and the Thames Region Flood and Coastal Committee to deliver the project. We also supported the construction work through design of flow control structures and setting the final water levels for the wetlands. The works that we carried out enabled Newton Park to be restored to cope with large amounts of rainfall, saving residents from flooding as well as providing significant water quality improvements to The Roxbourne Brook. 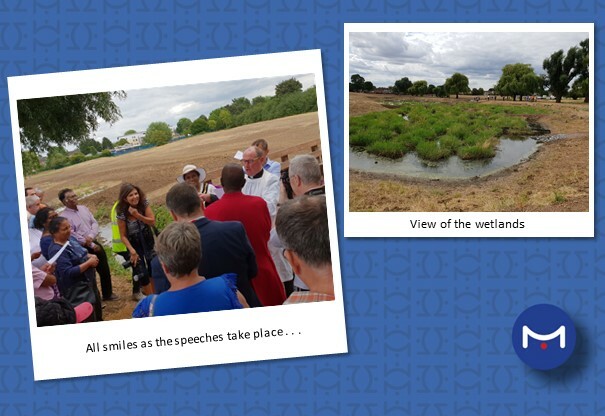 The Newton Park West Flood Storage Area and River Restoration Scheme is therefore a rewarding one for us and we were happy to be invited to the park’s opening. We particularly enjoyed meeting the officials who opened the event: Tony Donetti (Harrow Council – Team Leader of Infrastructure), the local MP, Lee James from the Environment Agency and the Mayor of Harrow. After the speeches and ribbon cutting we surveyed the planting that was done by two local schools that same day (organised by charity Thames21). -A special thanks to Ebsford who carried out the construction work and to Harrow Council for their professional trust and support throughout the project.